Adele Anthony performed the Nielsen with CityMusic Cleveland. The Plain Dealer: "Beyond assurance, Anthony evinced that much rarer sense of grasping the score entirely, of understanding where every note fits in the larger picture. On top of that she boasted staggering technical ability and a warm tone that filled the space easily and fully." 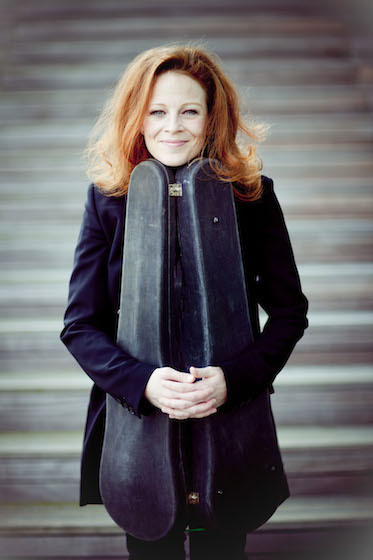 Carolin Widmann premiered the Julian Anderson concerto with the London Philharmonic. The Guardian: "Widmann proved an exemplary soloist, while the piece itself felt in no way overshadowed by the expertly conducted complete performance of Ravel’s Daphnis and Chloé that followed." The Telegraph: "Anderson (hid) his soloist Carolin Widmann in the wings at the opening, so her first tentative notes were like ‘noises off.’ As she emerged and made her way by degrees to the solo spot next to conductor Vladimir Jurowski, so the piece took shape. That shape was ingenious, and best summed up as ‘looking for an identity, and eventually finding it.'" Holly Mulcahy performed the Higdon with the Chattanooga Symphony. Times Free Press: "Mulcahy seemed to meet the musical demands with ease and assurance. Her intonation was impeccable, and she dazzled with the mid-movement cadenza." Nicola Benedetti performed Mozart's Violin Concerto No. 5 with Camerata Salzburg. Herald Scotland: "The challenge with such material is surely in achieving the delicacy and precision necessary without sacrificing expression - a feat she accomplished with assurance and flair." Vadim Repin performed the MacMillan with the St. Louis Symphony Orchestra. St. Louis Post-Dispatch: "Violinist Vadim Repin, for whom the concerto was composed, gave a compelling account of a fascinating piece that ranged from the frenetic to the jazzy, from passages with a Celtic feel to Asian influences, with dark, unsettling elements and wild cries in the brass." Caroline Shaw premiered her violin concerto, "Lo," with the Cincinnati Symphony Orchestra. Cincinnati Enquirer: "In two unbroken movements, the concerto was deeply lyrical and seamlessly constructed....It was consistently imaginative -- fragments of melody came and went, and glimmering atmospheres contrasted against intense sound blocks....The violinist's phrases were haunting, sometimes soaring rhapsodically over busy pizzicatos in the strings or bubbling winds. She performed a delicate, introspective cadenza." Pekka Kuusisto performed the Sibelius with the Charlotte Symphony Orchestra. Charlotte Observer: Kuusisto stood out. He committed at every moment to Sibelius’ music, whether spinning a thread of tone in his opening bars or turning to the orchestra with a smile between solos, absorbing energy for his next entrance....He’s a specialist in new music, and the secret (of course) is that all music was new at some point. The best players can make a concerto from 1905 sound as if it still is." Augustin Hadelich performed Mozart's Violin Concerto No. 5 with the Baltimore Symphony Orchestra. Baltimore Sun: "His tone was sweet, without turning syrupy; his articulation was pristine, but never glib. And he provided fresh cadenzas that gave Mozart's themes all sorts of imaginative dimensions. Note, too, that, in keeping with conventions of the composer's day, Hadelich frequently played along with the orchestra's first violins before breaking into his solos." Washington Post: "Matching the soprano’s exploits was violinist Augustin Hadelich, who had an astonishing solo turn in Mozart’s fifth violin concerto; it was both technically and musically impeccable. As the final sign of his consummate musicianship, Hadelich played his own fascinating cadenzas, daringly laden with double-stops. A nightcap of Paganini’s ninth caprice, nicknamed 'La Chasse,' a further study on double stops, was the perfect finish." James Ehnes premiered the James Newton Howard concerto with the Pacific Symphony. Orange County Register: "Ehnes, a distinguished Canadian violinist, played the work, surprisingly, from memory. One could imagine a more fiery performance here and there, but I liked the way he played it all calmly, neatly, honestly." Ilya Gringolts performed Bach’s A minor Violin Concerto with the City of Birmingham Symphony Orchestra. The Guardian: "Ilya Gringolts was the soloist this time – rather luxury casting for a work that lasts barely 15 minutes, but his playing had enough panache and swagger about it to turn the concerto into a convincing showcase for his virtuosity." Jennifer Koh performed Scelsi's "Anahit" with the Los Angeles Philharmonic. Violinist.com: "Violinist Jennifer Koh gave an energetic and committed performance of "Anahit" by Giacinto Scelsi, accompanied by an orchestra of about 20, led by Dudamel." Los Angeles Times: "The solo violin, led on a transcendent journey by an 18-piece droning ensemble, relies on the intensity of bent tones with otherworldly implications, and Koh made every note mesmerizing."